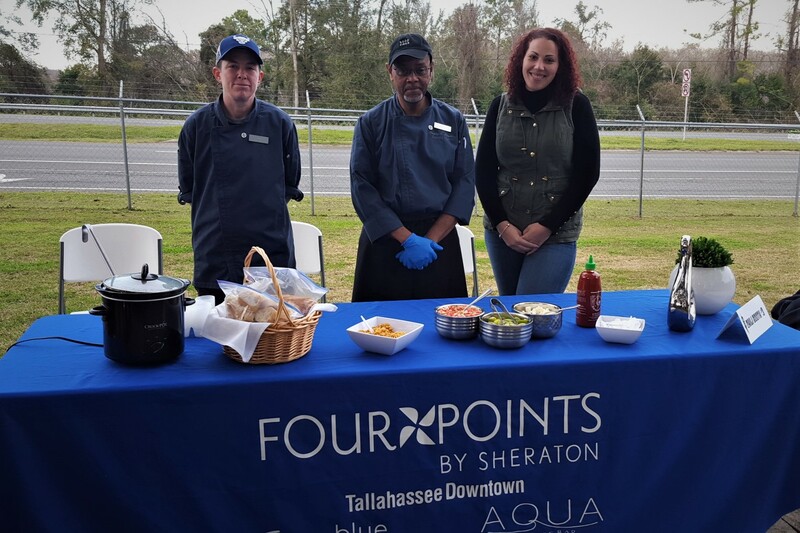 Saturday, January 26 - Chilly temps didn't stop Tallahassee from attending the MayDay Outdoor Services 10th Annual Chili Cook-Off benefiting Pyramid Studios! People came out in droves for spicy taste testing and friendly networking all to support the programs at Pyramid Studios. Enjoying all-you-can-taste chili, music, refreshments, photo booth snaps, merriment and just plain old fashioned fun, guests also had the opportunity to browse and purchase works created by Pyramid artists. Those works included hand knitted scarves and hats, that flew off the sales table in the cold evening air. Chili Winners: First Place - Executive Chef Greg Brown of Four Points Sheraton for his lamb chili; Second Place - Tallahassee Developmental Center Food Services Director Steven Brockman for his siracha and cayenne spiced chili; and Third Place - Mark Bell of MayDay Outdoor Services for his spicy traditional chili. Booth Winners: First Place - Capital Plumbing, Inc. with their tiki hut and ukulele strumming; Second Place - Booth Champion of 9 years, Brandon Smith, for his tropical drink complete with bendy straw and umbrella; and Third Place - Marc Bell for his Hawaiian Beach scene where guests could "catch" a wave! We want to congratulate all the winners and thank everyone who participated or supported the event, including: Greg Tish (who also provided awesome tunes and emcee skills), The Bug Man's Terry Womble, Fidelity Bank, Sonny's BBQ, Desserts by Julia. Our biggest thanks go out to MayDay Outdoor Services, Inc., including owner Rick May and manager Marc Bell, for their continued sponsorship and hosting of this awesome event. For more photos of the 10th Annual MayDay Outdoor Services Chili Cook-Off, visit our Facebook page by clicking here!